While the earth has been warming overall, the giant East Antarctic ice sheet  which holds about five times as much ice as West Antarctica and Greenland combined  has actually been growing in size. That's because East Antarctica is far too cold, even in summer, for any appreciable melting to happen. And since a warmer world means more precipitation, any extra snow that falls on East Antarctica stays there indefinitely. Or at least, that's how things have gone until recently. But a new study in the journal Nature Geoscience suggests that this growth spurt may have come to an end. 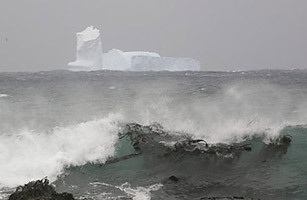 Starting in about 2006, says lead author Jianli Chen of the Center for Space Research at the University of Texas at Austin, East Antarctica started declining, just like the world's other great ice sheets. "The amount [of decline] right now isn't very big, but the trend is alarming," he says. It's alarming because the behavior of ice sheets is the biggest variable in estimates of how sea levels will rise over the next century  the faster ice sheets melt, the more sea levels will rise. As recently as 2007, the Intergovernmental Panel on Climate Change (IPCC) admitted in its fourth major climate-assessment report that there simply wasn't enough data to make a useful projection. But since then, satellite observations have shown that the ice in both Greenland and West Antarctica is sliding into the sea faster than anyone expected. And now it's happening in East Antarctica as well. The new evidence comes from the Gravity Recovery and Climate Experiment, or GRACE. It's a pair of satellites that circle the planet in tandem, moving slightly closer together or farther apart as they fly over regions of higher or lower local gravity  higher over a mountain range, for example, lower over a crater. Starting in 2006, GRACE began to detect lower gravity over East Antarctica, suggesting that the ice sheet was getting less massive. Exactly how much isn't clear: the best guess is about 57 billion tons per year, but with a huge uncertainty of plus or minus 52 billion. That's because Chen and his colleagues had to factor in something called Post Glacial Rebound, or PGR: during the last Ice Age, Antarctica had far more ice than it does today, and all that ice weighed down the underlying bedrock. With some of the ice gone, the rock is rising back up, like a mattress regaining its shape when a sleeper gets off  and as the depressed rock rises, so does the gravity it exerts on GRACE. "There's large uncertainty in the models of PGR," says Chen, so there's a corresponding uncertainty in how much ice is being lost." But it isn't the amount that matters so much at this point, says Konrad Steffen, director of the University of Colorado's Cooperative Institute for Research in Environmental Sciences. "It's that there's been a major change from stability to ice loss." As for what's causing East Antarctica to lose ice, it's probably much the same phenomenon as in West Antarctica and Greenland. Warming ocean temperatures are melting or weakening the ice where glaciers flow into the sea, and with less ice grinding on the sea floor, there's less friction. That lets ice from the interior flow seaward more quickly. "If you have ice loss," says Steffen, "it has to do with an increase in ice velocity." What that means for the future is unclear. Nobody really imagines that the whole East Antarctic ice sheet will slide into the sea anytime in the near future  and that's good because if it did, sea levels would go up 200 ft. or more. But with current projections hovering at about 3 ft. of sea-level rise by 2100 without any contribution from East Antarctica, the trend is worrisome. It isn't just the sea-level rise people have to worry about either: on Tuesday, glaciologists reported that at least 100 icebergs, and possibly more, are headed toward New Zealand, where they could pose a hazard to shipping. The bergs are fragments of a giant ice floe that broke off the frozen continent last year  one more example of the ominous fact that what happens in Antarctica doesn't stay in Antarctica.  Michael D. Lemonick is the senior science writer at Climate Central.